Honda CR-V is built to last! The Honda CR-V I own is the best vehicle I have ever owned. It is all wheel drive, and I was most impressed in the vehicle's ability to drive thru snow. Its a 4 cylinder and it saves on gas but you would never feel like it doesn't perform like any 6 cylinder SUV. I've done all regular maintenance needed such as oil and transmission fluid changes as Honda says should be done. I've only had minimal issues with it, such as a small radiator leak at 220, 000 miles. I also replaced the hoses and the thermostat when getting an new radiator, but they weren't bad I just figured it was a good thing to do while having to take the hoses loose to replace the radiator. I purchased the radiator from amazon for under $60. It's just amazing that the car has over 230, 000 miles and runs and drives perfectly. When I purchase a newer CR-V my daughter wants this one as they are great to carry things in the back that you cannot fit in a car trunk. Our dog also loves the vehicle and rides in it weekly. I am far from a perfectionist and don't go out of my way to keep the interior perfect. The seats and all still look like new. The materials used were made to last for sure. I highly recommend the Honda CR-V for anyone as its economical and gives me and my family such security knowing it won't break down on long trips or as our daily driver. It's also safer than a car, doesn't cost a fortune like a full size SUV, and gets great gas mileage as it has a 4 cylinder engine. 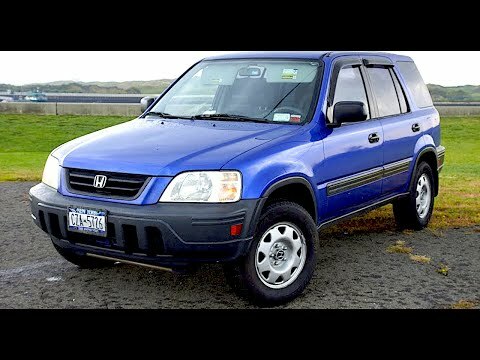 The Honda CR-V has lived up to the reputation of the manufacturer and gone the distance so far (purchased new 20 yrs ago). I cannot say enough about Honda quality for that generation of vehicles. The Honda CR-V is my vehicle right now because it was my wife's turn to buy a car (I inherited this one). It's a good car to get around in. It has space to pack a good load and move it around. And, best of all, it has been reliable. I have to say that it's most endearing quality to me right now is that it's paid off and has been for a while. My primary dislikes on the vehicle are that it is red (not my choice) and that it is one of the dullest vehicles around in terms of style. I have looked at various ways to spruce it up to no avail. Best little car I've ever had. My Honda crv is a very good reliable little car. Gets very well gas mileage. It's very inexpensive for the most part to buy parts and put them on. I've driven all around town several times a day and I've even taken trips in and out of town 3 times one day and my car hasn't missed me yet. Very spacious. I love my hatch back. I feel safe inside my car. It's not plastic like most vehicles you see today.